Massage Oils: Weleda, Oshadhi, Lotus Aroma, Tisserand, Bindi! • Baby Tummy Oil: Natural Colic Relief to help relax and soothe your baby's tummy. Baby's upset tummy gets soothing care from our relaxing Weleda Baby Tummy Oil. This natural colic reliefis a calming blend of essential oils that eases your baby's discomfort after a feeding and helps relieve stress. Our carefully crafted natural colic relief formula gently soothes your baby with essential oils of marjoram, Roman chamomile and cardamom. Your baby's skin is rendered soft and supple by a sweet almond oil base in our Baby Tummy Oil that is easily tolerated and absorbed. A gentle tummy massage complements your maternal love with the soothing comfort of our Weleda Baby Tummy Oil. Transform burps and gurgles into smiles and giggles and turn that baby frown upside-down with the touch of a belly button. 1.7 oz. ORDER TODAY! Ingredients: Prunus Amygdalus Dulcis (Sweet Almond), Fragrance (Parfum), Limonene, Linalool. • Calendula Baby Oil: A natural baby oil that gently moisturizes delicate skin. Give your baby a loving warm wrap and long-lasting protection with our nourishing Weleda Calendula Oil. Particularly suitable for daily care, this natural baby oil is an excellent product for baby massage and for cleansing the diaper area. Protecting baby from skin-damaging environmental influences, Weleda Calendula Oil helps to provide a healthy balance to your child's delicate skin. The nurturing combination of Biodynamic® and organic calendula flower extract and organic chamomile flower extract in this natural baby oil calms irritation and softens your baby's skin. In our Weleda Calendula Oil, a base of sweet almond oil also works gently, delivering essential fatty acids that deeply nourish and moisturize, keeping your baby's skin smooth and supple – even in the sensitive diaper area. With this natural baby oil your soft, happy baby is wrapped in a layer of long-lasting warmth and protection. Your baby deserves to be pampered with our Weleda Calendula Oil—it's hard work always being so impossibly beautiful. Our Weleda Calendula Oil takes care of baby's delicate skin for 50 years. 6.5 oz. ORDER TODAY! Ingredients: Prunus Amygdalus Dulcis (Sweet Almond) Oil, Calendula Officinalis Flower Extract, Chamomilla Recutita Matricaria (Chamomile) Flower Extract, Fragrance (Parfum), Limonene, Linalool, Geraniol. 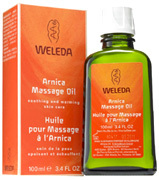 • Arnica Massage Oil: Tired, aching muscles get immediate relief with this nourishing oil. Arnica Massage Oil is a soothing natural beauty treatment that deeply nourishes your skin as your body and mind relax. When used in combination with massage, organic and wild-crafted arnica flower extract provides a soothing layer of warmth that unwinds your taxed and tight muscles to relieve stress. Organic sunflower seed and olive oils are easily tolerated and absorbed by your skin, restoring moisture and nourishment. Packed with vitamin E and essential fatty acids, they help soften and tone your skin. Essential oils of lavender and rosemary calm your mind while your skin soaks in soothing nourishment and your muscles get some potent and well-deserved replenishment. With body and mind nourished and relaxed, there's no more room for tight, aching muscles in your naturally beautiful being. 3.4 oz. ORDER NOW! Ingredients: Helianthus Annuus (Sunflower), Olea Europaea (Olive), Fragrance (Parfum), Arnica Montana, Betula Alba, Limonene, Linalool*, Geraniol, Coumarin. • Body Oil Pomegranate Regenerating: Pomegranate Regenerating Body Oil helps slow the aging process and renders your entire body smooth, firm and naturally beautiful. Antioxidant-rich, organic pomegranate seed oil helps promote skin renewal and improve the firmness of your skin while actively protecting it from skin-damaging free radicals. This natural oil moisturizer is a nourishing full-body treatment that regulates moisture balance and restores your natural vitality with potent antioxidants and essential fatty acids. Regular use helps promote skin renewal --for skin that looks as radiant and youthful as you feel. Dermatologically tested. 3.4 oz. ORDER NOW! Ingredients: Simmondsia Chinensis (Jojoba) Seed Oil, Sesamum Indicum (Sesame) Seed Oil, Helianthus Annuus (Sunflower) Seed Oil, Triticum Vulgare (Wheat) Germ Oil, Macadamia Ternifolia Seed Oil, Panicum Miliaceum (Millet) Seed Extract, Fragrance (Parfum), Punica Granatum (Pomegranate) Seed Oil, Helianthus Annuus (Sunflower) Petal Extract, Olea Europaea (Olive) Oil Unsaponifiables, Limonene, Linalool, Citronellol, Geraniol, Citral, Eugenol, Coumarin, Farnesol. 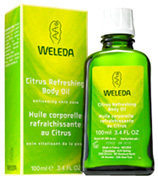 • Body Oil Citrus Refreshing: Faded, tired skin gets revitalizing moisture with this invigorating body oil. Citrus Refreshing Body Oil is a refreshing blend that brightens and tones your skin, while your senses are jump-started by a rush of citrus-infused aroma-therapy. Lemon peel oil is rich with invigorating essential oils and possesses skin-tightening and toning properties that revitalize your skin and senses. Your skin's natural moisture is ensured and protected by a high content of essential fatty acids in a base of sweet almond oil. Well-tolerated by even the most sensitive skin, your body easily absorbs the nourishment for a soft, supple appearance and feel. Soak up our unique complex of replenishing nutrients and invigorating essential oils for firm, smooth, luminous skin. Ready, set, glow! 3.4 oz. ORDER NOW! Ingredients: Prunus Amygdalus Dulcis (Sweet Almond) Oil, Alcohol, Citrus Medica Limonun (Lemon) Peel Oil, Fragrance (Parfum), Limonene, Linalool, Geraniol, Citral. • Body Oil Lavender Relaxing: Your tired body and spirit find soothing care with our most relaxing oil. Lavender Relaxing Body Oil is calming blend that restores essential moisture balance to soften your skin and melt away the stresses of your day. This tension-taming oil is rich with organic lavender oil, known for its balancing and soothing fragrance. Sweet almond and sesame seed oils ensure that the high content of essential fatty acids are extremely well-tolerated and easily absorbed to protect it from drying. Your skin feels smooth and soft, while your mind is calm, relaxed and ready for a restorative sleep. Soft, beautiful skin and sweet dreams awaken a healthier, more beautiful you. 3.4 oz. ORDER TODAY! Ingredients: Sweet almond oil, sesame oil, lavender oil, fragrance, natural essential oils. • Body Oil Sea Buckthorn: Thirsty, tired skin in need of intensive replenishment gets nutrient-rich moisture with this revitalizing oil. Sea Buckthorn Body Oil is a replenishing full-body treatment packed with antioxidants and vitamins to nurture and protect your skin's radiant health, particularly after exposure to the sun. Sea buckthorn berry and seed oil is packed with essential fatty acids that replenish vital moisture, while pro-vitamin A and vitamin E soften and protect your skin. Formulated with organic sesame seed oil that delivers antioxidants, it's a nutrient-rich power duo that absorbs easily to intensely nourish your skin, produce lavish moisture, protects your skin from free radical damage, and saturates your body in the aroma of sun-drenched essential oils from mandarins, oranges and grapefruits. When you revitalize your natural beauty with this citrusy, skin-loving body oil, every day is a sunny day for your soft, radiant skin 3.4 oz. ORDER TODAY! Ingredients: Sesamum Indicum (Sesame) Seed Oil, Hippophae Rhamnoides (Sea Buckthorn) Oil, Fragrance (Parfum), Limonene, Linalool, Benzyl Benzoate, Benzyl Salicylate, Geraniol, Citral, Farnesol. • Stretch Mark Massage Oil (Preganancy Body Oil): Stretch Mark Massage Oil made with almond oil helps smooth tight skin and prevent stretch marks. Nutrient-rich Weleda Stretch Mark Massage Oil is an intensive hydration that nourishes and smoothes stretching skin as your baby grows. A base of sweet almond oil in our Stretch Mark Massage Oil works gently, delivering intensely moisturizing essential fatty acids that keep your skin supple and protected from drying. Because pregnancy is a big job for your muscles and skin, our organic arnica flower extract helps ease tightness and provides a layer of comforting warmth when you indulge yourself with our almond stretch mark massage oil. Weleda Stretch Mark Massage Oil also contains nourishing wheat germ oil conditions and refines your skin's texture with a high quantity of vitamins A, D and E. Regular use of this almond stretch mark massage oil visibly helps to correct the appearance of stretch marks on your pregnant belly, your thighs, bottom and breasts, and helps prevent the appearance of new ones. 3.4 oz. ORDER TODAY! Ingredients: Sweet Almond (Prunus Amygdalus Dulcis), Simmondsia Chinensis (Jojoba), Triticum Vulgare (Wheat), Arnica Montana, Fragrance (Parfum). 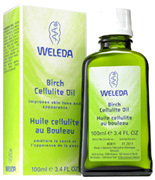 • Birch Cellulite Oil: Cellulite gets visibly toned down after just one month with this revitalizing oil. Birch Cellulite Oil is a dermatologically proven treatment that nourishes your skin with pure natural and organic plant extracts to smooth, tone and support your skin's overall health. A potent extract of organic birch leaves, known for its purifying and detoxifying effects, promotes radiant skin with noticeably improved texture and smoothness. Dermatological tests show a 21% increase in smoothness and a 22% increase in tightness after just one month of twice a day regular use. Apricot kernel oil, skin-friendly organic jojoba seed oil and vitamin-rich wheat germ oil nourish your skin, balance essential moisture and enliven your appearance. Say "see ya!" to cellulite and embrace the youthful appearance of your toned, beautiful skin. Europe's #1 Natural Body Care Seller! 3.4 oz. ORDER TODAY! Ingredients: Prunus Armeniaca (Apricot) Kernel Oil, organic Simmondsia Chinensis (Jojoba) Seed Oil, Triticum Vulgare (Wheat) Germ Oil, Fragrance (Parfum from natural essential oils), Limonene, Linalool, Geraniol, Citral, organic Betula Alba (Birch) Leaf Extract, Ruscus Aculeatus Root Extract, Rosmarinus Officinalis(Rosemary) Leaf Extract. 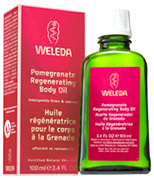 • Body Oil Wild Rose: Deserving skin finds indulgent renewal and radiant beauty with this luxurious body oil. Wild Rose Body Oil is a full-body pampering with our most precious extract for rich moisture and a nourished glow. Your skin is rendered lusciously supple and protected from skin-damaging free radicals and environmental influences by the essential fatty acids antioxidants and vitamins A and E that are highly concentrated in our organic rosehip seed oil. Organic rose flower oil is prized for its harmonizing aroma therapeutic properties that promote your inner balance and relaxation. A base of organic jojoba seed oil ensures this blend is easily absorbed, keeping your skin soft to the touch and giving you a radiant glow. 3.4 oz. ORDER TODAY! Ingredients: Jojoba (Buxus Chinensis) Oil, Sweet Almond (Prunus Dulcis) Oil, Musk Rose (Rosa Moschata) Oil, Rose (Rosa Centifolia) Oil, Fragrance (Parfum), Natural essential oils. MASSAGE OIL: Baby Tummy Oil, 1.7 oz. MASSAGE OIL: Stretch Mark Massage Oil (Pregnancy Body Oil), 3.4 oz. 1001 Nights: Sensual, Relaxing & Inspirational. Relieves anxiety. Use for full-body massage, or specific areas such as neck or shoulders to calm the nervous system and relieve emotional tension. As a body care oil, best used after shower or bath. CAUTION: For external use only. Avoid contact with eyes. Germany. • 1001 Nights: 100 ml. ORDER TODAY! • 1001 Nights: 200 ml. ORDER TODAY! Ingredients: Jasmine, rose, turkish Sandalwood, Ylang Ylang, Chamomile.This therapeutic massage oil is formulated with a high concentration of 100% pure Oshadhi essential oils in a base of organic sesame, hazelnut, and sunflower oil. Silhouette Slimming: Cellulite Reduction Support. Use for full-body massage to support a cellulite reduction program. Stimulates detoxification and lymphatic circulation. As a body oil, best used after shower or bath. CAUTION: For external use only. Avoid contact with eyes. Germany. ORDER TODAY! • Silhouette Slimming: 100 ml. ORDER TODAY! • Silhouette Slimming: 200 ml. ORDER TODAY! Ingredients:: Eucalyptus Dives, Cedar, Juniper, Cypress. This therapeutic massage oil is formulated with a high concentration of 100% pure Oshadhi essential oils in a base of organicsesame, hazelnut and sunflower oil. • Moonstone: Profoundly Relaxes & Renews the Spirit. Transporting. Use for full-body massage, or specific areas such as neck or shoulders to calm the nervous system and relieve emotional tension. As a body oil, best used after shower or bath. CAUTION: For external use only. Avoid contact with eyes. Germany. 100 ml. ORDER TODAY! Ingredients: Angelica Root, Orange, Spiknard, Mandarin, Lavender. This therapeutic massage oil is formulated with a high concentration of 100% pure Oshadhi essential oils in a base of organic sesame, hazelnut, and sunflower oil. • Morning Dew: Energizes and Refreshes. Energizes, Uplifts. Use for full-body massage, or specific areas such as feet, neck, and shoulders to relieve physical and mental fatigue, and ease mild depression. As a body oil, best used after shower or bath. CAUTION: For external use only. Avoid contact with eyes. Germany. 100 ml. ORDER TODAY! Ingredients: Mint, Lime, Lemon, Marjoram.This therapeutic massage oil is formulated with a high concentration of 100% pureOshadhi essential oils in a base of organicsesame, hazelnut, and sunflower oil. MASSAGE OIL: Silhouette Slimming 200 ml. MASSAGE OIL: 1001 Nights, 100 ml. MASSAGE OIL: 1001 Nights, 200 ml. Relaxing Extra: Deeply Relaxes & Calms. Calms the nervous system. Relaxes. Relieves stress. Use for full-body massage, or specific areas such as neck or shoulders to calm the nervous system and relieve emotional tension. As a body oil, best used after shower or bath. CAUTION: For external use only. Avoid contact with eyes. Germany. ORDER TODAY! • Relaxing Extra: 50 ml. ORDER TODAY! • Relaxing Extra: 100 ml. ORDER TODAY! • Relaxing Extra: 200 ml. ORDER TODAY! Ingredients: Lavender extra, Ylang Ylang, Eucalyptus. This therapeutic massage oil is formulated with a high concentration of 100% pure Oshadhi essential oils in a base of organic sesame, hazelnut, and sunflower oil. Sports Massage: Relieves Muscle Aches & Stiffness. Muscle strain relief. Use for full-body massage, or specific areas such as neck or shoulders to calm the nervous system and relieve emotional tension. As a body oil, best used after shower or bath. CAUTION: For external use only. Avoid contact with eyes. Germany. ORDER TODAY! • Sports Massage: 50 ml. ORDER TODAY! • Sports Massage: 100 ml. ORDER TODAY! Ingredients: Camphor, Eucalyptus, Citriodora, Bay Laurel. This therapeutic massage oil is formulated with a high concentration of 100% pure Oshadhi essential oils in a base of organic sesame, hazelnut, and sunflower oil. Stress Free: Calms & Relaxes. Muscle strain relief. Tension relief/Uplifting. Use for full-body massage, or specific areas such as neck or shoulders to calm the nervous system and relieve emotional tension. As a body oil, best used after shower or bath. CAUTION: For external use only. Avoid contact with eyes. Germany. ORDER TODAY! • Stress Free: 50 ml. ORDER TODAY! • Stress Free: 100 ml. ORDER TODAY! • Stress Free: 200 ml. ORDER TODAY! Ingredients: Petitgrain Bigarade, Lavender, Orange Bitter, Sandalwood. This therapeutic massage oil is formulated with a high concentration of 100% pure Oshadhi essential oils in a base of organic sesame, hazelnut, and sunflower oil. Tropical Sun: Immune support/Warming. Use for full-body massage, or specific areas such as neck or shoulders to calm the nervous system and relieve emotional tension. As a body oil, best used after shower or bath. CAUTION: For external use only. Avoid contact with eyes. Germany. ORDER TODAY! • Tropical Sun: 100 ml. ORDER TODAY! • Tropical Sun: 200 ml. ORDER TODAY! Ingredients: Niaouli, Cajeput, Tea Tree m.a., Cinnamon Leaf. This therapeutic massage oil is formulated with a high concentration of 100% pure Oshadhi essential oils in a base of organic sesame, hazelnut, and sunflower oil. MASSAGE OIL: Relaxing Extra, 50 ml. • Back Massage: Relieves Backache & Stiffness. Warming/Relaxing. Use on the entire back or specific areas of discomfort such as the lower back, neck, or shoulders to relieve aches, strains, and stiffness. As a body oil, best used after shower or bath. CAUTION: For external use only. Avoid contact with eyes. Germany. 100 ml. ORDER TODAY! Ingredients: Ginger, Camphor, Benzoin, Wintergreen This therapeutic massage oil is formulated with a high concentration of 100% pure Oshadhi essential oils in a base of organic sesame, hazelnut, and sunflower oil. • Foot Care: Restore/Refreshing. Use for full-body massage, or specific areas such as neck or shoulders to calm the nervous system and relieve emotional tension. As a body oil, best used after shower or bath. CAUTION: For external use only. Avoid contact with eyes. Germany. 100 ml. ORDER TODAY! Ingredients: Oregano, Cinnamon Leaves Tea Tree, Bay St. Thomas. This therapeutic massage oil is formulated with a high concentration of 100% pure Oshadhi essential oils in a base of organic sesame, hazelnut, and sunflower oil. • Joint Massage: Warming/Comforting. Releaves sore, stiff joints and muscles. Use for full-body massage, or specific areas such as neck or shoulders to calm the nervous system and relieve emotional tension. As a body oil, best used after shower or bath. CAUTION: For external use only. Avoid contact with eyes. Germany. 100 ml. ORDER TODAY! Ingredients: Thyme Thymol Eucalyptus Polybractea. This therapeutic massage oil is formulated with a high concentration of 100% pure Oshadhi essential oils in a base of organic sesame, hazelnut, and sunflower oil. • Cellulite Reduction Support: Relieves Backache & Stiffness. Warming/Relaxing. Stimulates detoxification and lymphatic circulation. Use on the entire back or specific areas of discomfort such as the lower back, neck, or shoulders to relieve aches, strains, and stiffness. As a body oil, best used after shower or bath. CAUTION: For external use only. Avoid contact with eyes. Germany. 50 ml. ORDER TODAY! MASSAGE OIL: Cellulite Reduction Support, 50 ml. Organic Cold Pressed Coconut Oil for Face, Body & Hair: Organic Coconut Oil is the perfect choice when you want to moisturize dry skin, massage for relaxation or even repair flaws . . . including stretch marks! Coconut oil is an exclusive moisturizer that can replenish and moisturize severe dryness and irritated skin. Coconut oil's natural anti-oxidant helps the skin repair itself and helps in anti-wrinkle treatment. The oil has natural anti-bacterial, anti-viral and anti-fungal properties to help shield the skin. Ideal for massage treatment. • Coconut Oil Fragrance Free: Fragrance Free is for fragrant sensitive skin and for those who wish to enjoy the natural purity of coconut oil. Use as a massage oil, moisturizer, or hair treatment. 12 oz. ORDER NOW! • Coconut Oil Pineapple Coconut: Let the natural, tropical aroma of Pineapple and Coconut arouse your island spirit. Use as a massage oil, moisturizer, or hair treatment. 12 oz. ORDER NOW! MASSAGE OIL: Organic Cold Pressed Coconut Oil, 12 oz. • Body Massage Oil Muscle Ease: A calming body oil to revitalize muscles and joints after workouts, sports or general over-exertion. Can also be used prior to activity, or simply to melt away everyday tension and fatigue. Contains hand blended oils used by professional therapists including: reinforcing organic Ginger oil, relieving organic Lemongrass oil, and invigorating organic Rosemary oil. 500ml/16.9 oz. ORDER NOW! Ingredients: Sesamum Indicum (Sesame) Seed Oil, Moringa Pterygosperma (Moringa) Seed Oil, Simmondsia Chinensis (Jojoba) Seed Oil, Zingiber Officinale (Ginger) Root Oil, Cymbopogon Citratus (Lemongrass) Oil, Rosmarinus Officinalis (Rosemary) Leaf Oil, Mentha Piperita (Peppermint) Oil, Citrus Aurantium Bergamia (Bergamot) Peel Oil, Origanum Marjorana (Marjoram) Oil, Lavandula Angustifolia (Lavender) Oil, Litsea Cubeba (May Chang) Oil, Salvia Hispanica (Sage) Oil, Tocopheral (Vitamin E), Citral, Limonene, Linalool, Geraniol, Citronellol. • Body Massage Oil De Stress: A soothing body oil to still the mind and calm the senses. Helps to bring back harmony, tranquil and wellbeing. Contains hand blended oils used by professional therapists including: relaxing organic Lavender oil, comforting organic Marjoram oil, balancing organic Mandarin oil. Rich in skin conditioning vitamins, antioxidants and omega 6 & 9. 500ml/16.9 oz. ORDER NOW! Ingredients: Sesamum Indicum (Sesame) Seed Oil, Moringa Pterygosperma (Moringa) seed Oil, Simmondsia Chinensis (Jojoba) Seed Oil, Lavandula Angustifolia (Lavander) Oil, Citrus Aurantium Bergania (Bergamot) Peel Oil, Citrus Reticulata (Mandarin) Oil, Origanum Marjorana (Morjoram) Oil, Citrus Aurantium (Neroli) Flower Oil, Citrus Aurantium (Petitgrain) Leaf Oil, Achillea Millefolium (Yarrow) Oil, Santalum Album (Sandalwood) Oil, Tocopherol (Vitamin E), Linalool, Limonene, Citral, Geraniol, Benzyl Benzoate. • Body Massage Oil Energy:An energizing body oil to re-charge a tired mind and body. Perfect in the morning to deliver get-up-and-go, or later in the day when stamina needs a increase. Contains hand blended oils used by professional therapists including: exhilarating organic Bergamot oil, energizing organic Grapefruit oil, and Balancing organic Lime oil. Rich in skin conditioning vitamins, antioxidants and omega 6 & 9. 500ml/16.9 oz. ORDER NOW! Ingredients: Sesamum Indicum (Sesame) Seed Oil, Moringa Pterygosperma (Moringa) Seed Oil, Simmondsia Chinensis (Jojoba) Seed Oil, Citrus Aurantium Bergamia (Bergamot) Peel Oil, Citrus Paradisi (Grapefruit) Peel Oil, Citrus Aurantifolia (Lime) Oil, Citrus Aurantium (Orange) Oil, Citrus Aurantium (Petitgrain) Leaf Oil, Cupressus Sempervirens (Cypress) Oil, Coriandrum Sativum (Coriander) Oil, Juniperis Communis (Juniper) Berry Oil, Tocopherol (Vitamin E), Limonene, Linalool, Geraniol, Citral. MASSAGE OIL: Body Massage Oil, 500 ml/16.9 oz. • Pure Blending Oil Face & Body: Easily absorbed and light textured, this exclusive blend of organic Moringa, Sesame and Jojoba oils provides a complete package of skin enhancing vitamins, antioxidants and deeply skin conditioning omega 6 and 9 oils. Leaves dry or dehydrated skin soft and silky smooth. Perfect for general facial and body massage. Ideal for all skin types. 100ml/3.3 oz. ORDER NOW! Ingredients: Sesamum Indicum (Sesame) Seed Oil, Moringa Pterygosperma (Moringa) Seed Oil Simmondisia Chinensis (Jojoba) Seed Oil, Juniperis Communis (Juniper) Berry Oil, Citrus Medica Limonum (Lemon) Peel Oil, Piper Nigrum (Black Pepper) Seed Oil, Cupressus Sempervirens (Cypress) Oil, Salvia Sclarea (Clary Sage) Oil, Litsea Cubeba (May Chang) Oil, Pelagonium Graveolerns (Geranium) Oil, Lavandula Angustifolia (Lavender) Oil, Mentha Piperita (Peppermint), Oil, Cedrus Atlantica (Cedarwood) Bark Oil, Rosmaninus Officinalis (Rosemary) Leaf Oil, Tocopherol (Vitamin E) Linalocci, Limonene, Citral, Geraniol, Citronellol. • Pure Blending Oil Grapeseed: Grapeseed oil performs well on any skin type from mature or damaged to normal skin types that needs a light textured oil to give smooth finish. Moisturizes and softens the skin. Naturally rich in Linoleic acid. Perfect for light facial and body massage. 100ml/3.3 oz. ORDER NOW! • Pure Blending Oil Jojoba: Jojoba is a liquid wax, very fitting with the skin's own natural oils and therefore beautifully absorbed. It provides a soft and beautifully moisturized texture. Help moisturizes, relaxes and conditions the skin. Naturally rich in antioxidants and essential fatty acids. Perfect for skin-balancing facial and body massage. Ideal for all skin types, chiefly beneficial to dry, delicate or mature skin. 100ml/3.3 oz. ORDER NOW! Ingredients: 00% Simmondsia Chinensis (Jojoba) Oil. • Pure Blending Oil Peach Kernel: With a Light, velvety and rich feel Peach Kernel delivers softness, elasticity and a silky appearance to all skin types, especially beneficial to dry, delicate or mature skin. Naturally rich in vitamin E and essential fatty acids. Perfect for facial massage. 100ml/3.3 oz. ORDER NOW! Ingredients: 100% Persica (Peach Kernel) Oil. • Pure Blending Oil Sweet Almond: Light textured and easily absorbed, Sweet Almond oil delivers penetrating nutrition to dry and even sensitive skins thanks to a blend of wonderful skin enhancing vitamins. Leaves dry or sensitive skin feeling soft and non-greasy. For general body and facial massage. Recommended for home use. 100ml/3.3 oz. ORDER NOW! Ingredients: 100% Prunus Dulcis (Sweet Almond) Oil. • Pure Blending Oil Wheatgerm: A luxurious treat for dehydrated or dull skin that need maximum nourishment due to aging or environmental damage. Packed with skin nurturing ingredients leaving the skin thoroughly moisturized. Helps rejuvenate and soften the skin. For nourishing facial massage. Ideal for dry or mature skin. Recommended for home use. 100ml/3.3 oz. ORDER NOW! Ingredients: 100% Triticum Vulgare (Wheatgerm) Oil. MASSAGE OIL: Pure Blending Oil, 100 ml/3.3 oz. MASSAGE OIL: Pure Blending Oil, Face & Body, 100 ml/3.3 oz. MASSAGE OIL: Pure Blending Oil, Jojoba, 100 ml/3.3 oz. Bath & Body Oil: Experience the pleasure of healthy, radiant skin with Soothing Touch Bath, Body and Massage Oils. Made from six vitamin-rich, deeply moisturizing oils, these Ayurvedic creations are the perfect solution to dry skin, fine lines and wrinkles. Add to your bath or smooth directly on to your body and enjoy the therapeutic benefits of herbal infusions and aromatherapy deeply softening your skin. • Bath & Body Oil Lavender: Our relaxing blend is infused with pure St. John's Wort and calming essential oil of Lavender, offering a fragrant tension tamer from a stressful day. 8 oz. ORDER NOW! • Bath & Body Oil Muscle Comfort Therapeutic: Our natural muscle pain reliever is infused with Arnica, essential oil of Eucalyptus and Peppermint for a soothing way to ease body, back and muscle soreness. 8 oz. ORDER NOW! • Bath & Body Oil Sandalwood: Our sensual blend is infused with a pure extract of Ginseng and the romantic scent of Sandalwood to revitalize your body and energize your spirit. 8 oz. ORDER NOW! BODY LOTION: Bath & Body Oil, 8 oz. Watersperse Massage & Bath Oil: Watersperse Massage & Bath Oil Watersperse Massage Oil is blended with the highest quality cold-pressed oils with a coconut derived skin conditioner which also facilitates the dispersibility of oil in water. Leaves your skin moist and non-greasy. Excellent soothing bath oil. Provides protective, nutritional mantles on the skin.Therapist tested. Add a unique aroma experience to your massage, bath or room by using one of our therapeutic blends. No more rancid sheets or stains, because the oil goes down with the wash water and not back onto your sheets. Sheets last longer and will not smell rancid when you use Watersperse™. • Massage & Bath Oil Almond Calming: A soothing aromatic blend. 8 oz. ORDER TODAY! • Massage & Bath Oil Eucalyptus Mint: A revitalizing, aromatic blend. 8 oz. ORDER TODAY! • Massage & Bath Oil Fragrance Free: A purely natural blend. 8 oz. ORDER TODAY! • Massage & Bath Oil Jasmine Refreshing: A soothing blend. 8 oz. ORDER TODAY! • Massage & Bath Oil Lavender Rain: A soothing blend. 8 oz. ORDER TODAY! • Massage & Bath Oil Sport Blend: An invigorating therapeutic blend. 8 oz. ORDER TODAY! • Massage & Bath Oil Blue Chamomile: A sedating blend. 8 oz. ORDER TODAY! Ingredients: Carthamus Tinctorius (Safflower) Seed Oil, Sesamum Indicum (Sesame) Seed Oil, Ethylhexyl Palmitate, PEG-40 Sorbitan Peroleate, Prunus Amygdalus Dulcis (Sweet Almond) Oil, Vitis Vinifera (Grape) Seed Oil, Persea Gratissima (Avocado) Oil, Tocopherol (Vitamin E), Tocopheryl (Vitamin E) Acetate. May contain Fragrance and Color. MASSAGE OIL: Watersperse Massage & Bath Oil, 8 oz. • French Lavender Everyday Body Oil: This all over moisturizing formula is a balanced blend of key beneficial oils to lightly hydrate and nurture all skin types. Fragrant French Lavender reveals soothing and restoring properties to nourish skin. Rich Jojoba Oils balances and naturally revitalizes skin health on a daily basis. Vitamin E a powerful antioxidant restores skin and reconditions skin suppleness. This lightweight and deeply conditioning blend is a perfect massage oil. 8 oz. ORDER NOW! Ingredients: Safflower (Carthamnus Tinctorius) Oil and/or Sunflower (Helianthus Annuus) Oil, Sweet Almond (Prunus Amygdalus Dulcis) Oil, Organic Jojoba (Simmondsia Chinensis) Oil, Tocopherol (Vitamin E), Lavender (Lavandula Officinalis) Essential Oil, Lavandin (Lavandula Hybrida) Essential Oil. MASSAGE OIL: French Lavender Everyday Body Oil, 8 oz. Use as a massage oil in bath water to soften skin or after bath or shower as all-over moisturizer to protect the skin. Can be used on the face to massage pressure points. • Balancing Massage Oil Vata: Warms, calms and relaxes the skin and body of the overactive Vata constitution. Nourish your dry and dehydrated skin, especially during the windy, dry and cold seasons. Warming herbs and plant oils of Almond oil, Lemon and Geranium moisturize and protects your skin as the aroma bathes your senses. 8 oz. ORDER TODAY! Ingredients: Sweet Almond Oil, Sesame Oil, Brahmi, Ashwagandha, Shatavari, Geranium, Lemon. • Balancing Massage Oil Pitta: Soothes and cools the muscles and skin of the sensitive Pitta constitution. Aids in the cooling of your body temperature and supports the healing calm needed for Pitta's active mind and personality. Pure herbs and delicate oils such as Almond oil, Camomile and rose extracts provide both aromatherapeutic and moisturizing benefits. 8 oz. ORDER TODAY! Ingredients: Sweet Almond Oil, Sunflower Oil, Camomile, Rose, Vetivert, Brahmi, Nagarmotta..
• Balancing Massage Oil Kapha: Warms and stimulates the muscles, skin and body of the Kapha constitution. Rejuvenate and stimulate lackluster temperaments without irritation. Aids in warming body temperatures and powerful therapeutic aromas help to energize underactive personalities. 8 oz. ORDER TODAY! Ingredients: Sweet Almond Oil, Safflower Oil, Clove, Lavender, Sage, Basil, Brahmi, Shatavari, Ashwagandha. • Massage Oil Premium: An incomparable balance of rich oils, Ayurvedic herbs, and delightful plant and flower essences to nuture and restore skin to a silky smooth freshness. Cools and soothes the nervous system, while therapeutically nourishing muscle tissue. Improves circulation and revitalizes dehydrated skin/ Aromatherapeutic properties work to relieve everyday tension. 8 oz. ORDER TODAY! Ingredients: Sweet Almond Oil, Brahmi, Ashwagandha, Shatavari, Rose, Rosemary, Sage, Basil, Cinnamon. MASSAGE OIL: Balancing Massage Oil, 8 oz. MASSAGE OIL: Premium Massage Oil, 8 oz. Original Formula Oil: This synergistic combination of six essential oils provides amazing relief on multiple levels. The natural essential oils are non-greasy and won’t stain most natural fabrics. MASSAGE: Provides FAST relief as it penetrates deeply to soothe aches and pains from simple backache, arthritis, rheumatism, muscle strains, bruises, sprains and tired sore feet. SPORTS & EXERCISE: Apply Olbas Oil to muscle areas BEFORE workouts to help relax tight muscles. Apply AFTER sports or exercise and massage gently to help reduce soreness and soothe overworked muscles. Bumps and bruises can be relieved by massaging a few drops on the affected area. HOME & WORK: Apply Olbas Oil to aching muscles in the arms, legs or back after a hard day on the job or working around the house. Apply to hands, fingers or feet to soothe and relieve aches and pains in the joints caused by arthritis, rheumatism or neuralgia. FAMILY USE & TRAVEL: Take some with you whenever you travel- great for those bumps, bruises and insect bites that inevitably come along. Massage on tired, sore feet and legs after prolonged periods of walking, standing or sports activity. Switzerland. ORDER TODAY! Ingredients: Essential oils of Peppermint, Eucalyptus, Cajeput, Wintergreen, Juniper and Clove. MASSAGE OIL: Original Formula Oil, .32 fl. oz. MASSAGE OIL: Original Formula Oil, 1.65 fl. oz.